Dina El-Wedidi, 24, has managed in only a couple of years to become a leading figure in Egypt's underground music scene and gain herself a spot as a young international music icon. "When she first heard the news, in a state of shock, she said: 'What about our concert at El Sakia Culturewheel?'" recalls Nancy Mounir, El-Wedidi's best friend and violinist in her band. "Up until now I can't believe that I have earned myself this scholarship and will work with Gilberto Gil for a year," El-Wedidi tells Ahram Online. El-Wedidi bears some similarities with her mentor to be, the Brazilian artist Gilberto Gil, with music that represents the political struggles of their respective people. According to the Financial Times, Gil is "a near-legendary performer and songwriter who has been an activist, rebel, politician, social campaigner and – for more than 50 years – tireless musical innovator." Following the Rolex Mentor and Protégé Arts Initiative announcement, El-Wedidi was featured in the Financial Times last month. The FT reported that El-Wedidi "is about to embark on a year-long association that is likely to prove stretching as well as exhilarating." In her interview with Ahram Online, El-Wedidi gazes at the ceiling. "Is the Financial Times that big?" she asks with a laugh. "I still can't believe it," she tells Ahram Online. El-Wedidi has done much in a short period of time. Following her graduation from the faculty of Arts at Cairo University in 2008, where she majored in Turkish and Persian literature, El-Wedidi is still in love with oriental languages. "I had spent some time working as a translator and sometimes a tour guide in Egypt, but this love I have for oriental cultures diverted me to the arts," she says. "I tried acting and singing." Fond of music and singing, El-Wedidi's stardom came by chance. "I was introduced to Egyptian singer Mariam Saleh, who advised me to join El-Wersha Performance group in 2008 to get more vocal and music training," she recounts. From 2008 to 2010, often training for six hours daily, "El-Wersha, and especially Hassan El-Gereitly, theatre director and founder of El-Wersha, gave me faith in my music abilities," she comments. "I never thought that I had a voice for singing." Madih (a principal religious genre of Arabic music) was El-Wedidi's first passion. "I used to train with Madih singers from Upper Egypt, like Sheikh Zain," she says. According to El-Wedidi, men have always dominated this genre and it was a great challenge for a young female to master it. "I often got harsh criticism, but the support I received was massive and gave me faith," she confesses. In line with Madih, El-Wedidi joined another singing group also inside El-Wersha, 'Habayebna' ('Our Beloved Ones'). "We worked on reproducing the heritage songs of Egypt… songs of Sheikh Imam, Sayed Darwish, and Om Kalthoum for example," she explains. Throughout her short journey over the past three years, El-Wedidi made another musical stop with Jazz musician Fathy Salama. The Salama workshop was an experience on its own and it was when the young artist first found her musical identity. "My first hit, Al-Haram ('The Forbidden') was born and was well received by audiences inside Egypt and abroad in the Middle East and Europe," El-Wedidi says. As successful as Al-Haram was, described by some as "courageous" and "challenging," to El-Wedidi it was not the best production from joining Salama – performing at jailhouses in Egypt was. "I was thrilled when I found out we were performing at Al-Kanater Jailhouse in 2010," says El-Wedidi, her eyes widening as she recalls the event. Annually, Al-Kanater Jailhouse organises a day for imprisoned women to enjoy a day with their spouses and children, and, in 2010, it was El-Wedidi's turn to join the fest. "And this was the production of this workshop… I realised my path in life, which is to serve the nation with music as it affects lives – even for just one day," she says. Challenging herself more, El-Wedidi was devoted to making her mark in the Egyptian music scene and helping develop the industry. "I never want to limit myself in recapturing the music of those legends," she states. "I totally respect those who do so, but I don't think that public is waiting for the glory of those good old day… why don't we make music that is close to us and our identity as those legends did?" Finding her identity was El-Wedidi's main aim; she wanted to compose and work on music that is close to Egyptians and speaks to the social, political and emotional aspects of Egyptian society. "I always aim to reflect our daily living in my music and songs," she explains. Her music is "fusion," as she describes it. "I don't believe that I am labelled with a genre. I mix jazz, folk and oriental," she says. 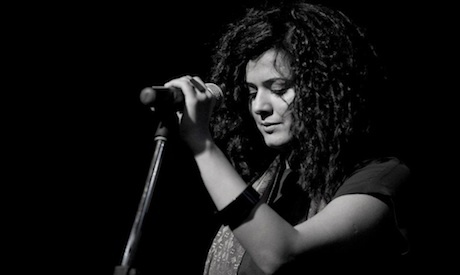 Beginning 2011, El-Wedidi had quit El-Wersha and founded her own music group of six members besides her. Coincidentally, the January 25 uprising broke out in Egypt and El-Wedidi took part in a modern Operetta, Khalina Nehlam ('Let's Dream'), with Egyptian band Masar Egbari, Tamer Shalaby, and Tunisian singers Mahdi Rabeh, Anis Dridi and Mohamed Bin Jemaa. The song was a great hit, capturing the Arab Spring of 2011. From then on, El-Wedidi's music group grew. "Our first official performance as an independent music group was back on 27 October at Al-Geneina Theatre. The size of the audience was surprising and gave me faith," she recalls. An active, young, diversified talent, and one of Egypt's most sought-after artists, El-Wedidi plans to tour the world with Gilberto Gil, with some performances in the UK and USA. With her winning the initiative, representing youth and the political arts, she states clearly: "I am not a singer of the Egyptian Revolution. I only belong to this generation and am devoted to speaking of it in my music. Currently, El-Wedidi is working with British guitarist and composer, Sam Miles, on the soundtrack of a movie about Bedouins that will be released internationally, the name of which will be announced soon.